We have a new publication out (direct link, open access), Müller Cell Metabolic Chaos During Retinal Degeneration authored by Bryan W. Jones, Rebecca Pfeiffer, William Ferrell, Carl Watt, James Tucker, and Robert Marc. Age-related macular degeneration (AMD) is a progressive retinal degeneration resulting in central visual field loss, ultimately causing debilitating blindness. AMD affects 18% of Americans from 65 to 74, 30% older than 74 years of age and is the leading cause of severe vision loss and blindness in Western populations. While many genetic and environmental risk factors are known for AMD, we currently know less about the mechanisms mediating disease progression. The pathways and mechanisms through which genetic and non-genetic risk factors modulate development of AMD pathogenesis remain largely unexplored. Moreover, current treatment for AMD is palliative and limited to wet/exudative forms. Retina is a complex, heterocellular tissue and most retinal cell classes are impacted or altered in AMD. Defining disease and stage-specific cytoarchitectural and metabolic responses in AMD is critical for highlighting targets for intervention. 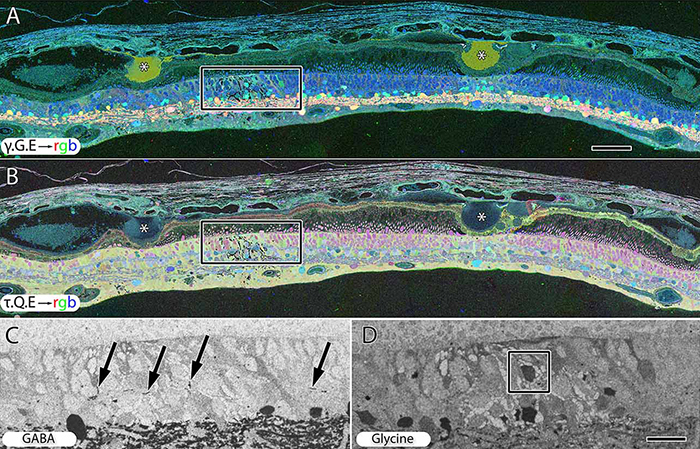 The goal of this article is to illustrate cell types impacted in AMD and demonstrate the implications of those changes, likely beginning in the retinal pigment epithelium (RPE), for remodeling of the the neural retina. Tracking heterocellular responses in disease progression is best achieved with computational molecular phenotyping (CMP), a tool that enables acquisition of a small molecule fingerprint for every cell in the retina. CMP uncovered critical cellular and molecular pathologies (remodeling and reprogramming) in progressive retinal degenerations such as retinitis pigmentosa (RP). We now applied these approaches to normal human and AMD tissues mapping progression of cellular and molecular changes in AMD retinas, including late-stage forms of the disease. This entry was posted in Publications, Retinal Disease, Retinal Remodeling and tagged age-related macular degeneration (AMD), AMD, Bryan Jones, Bryan William Jones, BWJones, Carl B. Watt, CMP, computational molecular phenotyping (CMP), electron microscopy, James Tucker, Müller cell, neural remodeling, photoreceptor, Rebecca L. Pfeiffer, retina, retinal pigment epithelium (RPE), retinal remodeling, Robert E. Marc, RPE, William D. Ferrell on May 24, 2016 by bwjones. We have a new publication out (direct link, open access), Müller Cell Metabolic Chaos During Retinal Degeneration authored by Rebecca Pfeiffer, Robert Marc, Mineo Kondo, Hiroko Terasaki and Bryan W. Jones. Müller cells play a critical role in retinal metabolism and are among the first cells to demonstrate metabolic changes in retinal stress or disease. The timing, extent, regulation, and impacts of these changes are not yet known. 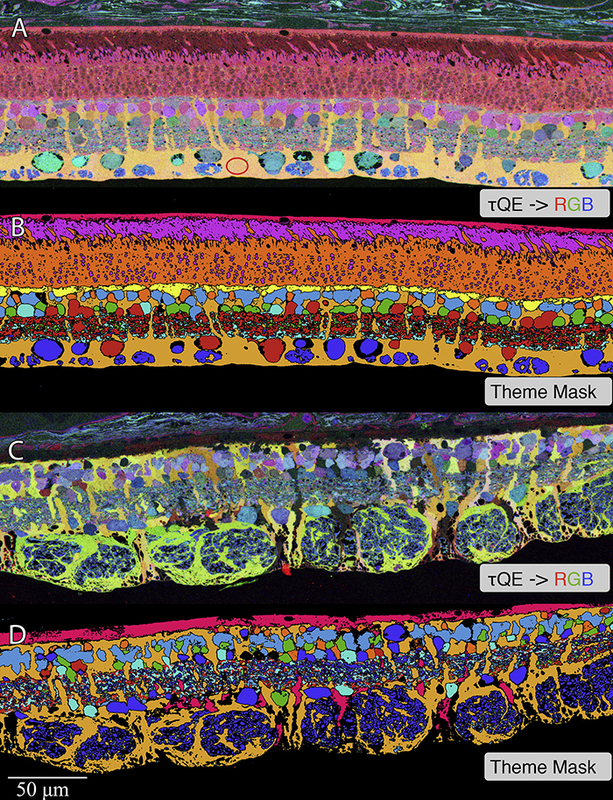 We evaluated metabolic phenotypes of Müller cells in the degenerating retina. Retinas harvested from wild-type (WT) and rhodopsin Tg P347L rabbits were fixed in mixed aldehydes and resin embedded for computational molecular phenotyping (CMP). CMP facilitates small molecule fingerprinting of every cell in the retina, allowing evaluation of metabolite levels in single cells. CMP revealed signature variations in metabolite levels across Müller cells from TgP347L retina. In brief, neighboring Müller cells demonstrated variability in taurine, glutamate, glutamine, glutathione, glutamine synthetase (GS), and CRALBP. This variability showed no correlation across metabolites, implying the changes are functionally chaotic rather than simply heterogeneous. The inability of any clustering algorithm to classify Müller cell as a single class in the TgP347L retina is a formal proof of metabolic variability in the present in degenerating retina. Although retinal degeneration is certainly the trigger, Müller cell metabolic alterations are not a coherent response to the microenvironment. And while GS is believed to be the primary enzyme responsible for the conversion of glutamate to glutamine in the retina, alternative pathways appear to be unmasked in degenerating retina. Somehow, long term remodeling involves loss of Müller cell coordination and identity, which has negative implications for therapeutic interventions that target neurons alone. This entry was posted in Publications, Retinal Disease, Retinal Remodeling and tagged Bryan Jones, Bryan William Jones, BWJones, CMP, computational molecular phenotyping (CMP), metabolism, Müller cell, Rebecca Pfeiffer, retina, retinal degeneration, retinal metabolism, retinitis pigmentosa, Robert E. Marc, Robert Marc, RP on May 7, 2016 by bwjones.